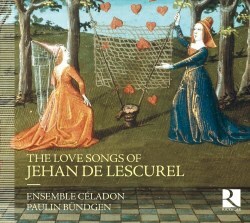 Who was Jehan de Lescurel and what kind of a composer was he? These questions have long fascinated Paulin Bündgen, counter-tenor, transcriber of this music and director of the Ensemble Céladon. To try to answer these questions we will start in the most unlikely of places – Salisbury Cathedral. Whilst standing in the chapter-house amidst the extraordinary and exquisitely realistic carvings one can’t help but feel that the faces are of real people who may almost have modelled for the sculptor before being placed in their niches and spandrels for ever. They date from the end of the 13th century about the time of Lescurel’s birth. Just two days before that I had again visited Chartres where the carved figures on the portals, superb as they are, are mostly stylised and the expressions are generic and austere. In the poems set by Lescurel we find a humane and more modern approach to Art with, for example, the naming of two women and a real feeling of emotional anguish. The music too is personal, very beautifully shaped, very secular, often melismatic just for the sake of it, and elegant. There is a greater sense of humanity than in the songs of the troubadours of the century earlier. An example of this more personalised poetry lies in Bietris est mes diles. “Bietris is my delight / my comfort and my joy / Wherever I may be, each day / Bietris is my delight”. As for the melodies just listen to the simple, limpid lines of Belle et noble, a bonne estrainne. Almost all of the texts are pithy and the songs consequently short, the longest, Dis tans plus qu’il ne foudrait flours, lasting five minutes, is the only one with the composer’s name given as an acrostic. In almost every textbook in which Lescurel is mentioned it is stated that he died as a criminal on the scaffold in 1303/4 having been accused of debauchery and theft. In Gilbert Reaney’s article "The Ars Nova in France" (The New Oxford History of Music, Volume 3) he is credited with 34 compositions. These ‘facts’ are repeated by Claude-Henry Joubert in his essay for an earlier (1995) disc of Lescurel. That's to be found on Virgin Veritas performed by the Ensemble Gilles Binchois who perform twenty of his songs. In the notes for this new recording the second essay (by Jerome Lejeune) states that this “hypothesis is clearly untrue, it is impossible to imagine that the author of these songs … could be confused with a bandit of the open road … published in one of the most important manuscripts containing work of the early Ars Nova only a few years before”. Scholars have now come to realise that the style of the music is more appropriate to the later decades of the 14th century. Lescurel is now credited with thirty-one compositions all recorded here. The manuscript containing Lescurel's pieces also has the motets known as the ‘Roman de Fauvel’. These are satirical and castigate the church and the then dual papacy; indeed all corrupt leaders of the time. Some have speculated that Lescurel may have been responsible for these pieces as well. Pleasingly the songs are presented in the order in which they appear in the manuscript. Many of the Fauvel motets are in three parts and are polytextual. Of these songs by Lescurel only the first, Amours, voules vous accorder, is in three parts. In some songs they have added at least one if not two parts to a monody. The main forms of the period are each employed by Lescurel, namely Rondeaux, Virelai and Ballade. From what we hear on this new disc, Lescurel was a a fine and cultured artist of the generation before Machaut and a man who could well have been very influential on the younger composer. The approach adopted by the Gilles Binchois ensemble is to perform some of the songs on instruments only including bagpipes. The example adopted by Ensemble Céladon is one which I wish was adhered to by more groups. All of the songs are vocalised. Those which are about women are sung by the male alto. Songs of a general nature are sung by soprano Anne Delafosse and songs about men by Clara Coutouly. Christopher Page has averred in his books on the performance of the music of this period ("The Owl and the Nightingale", Dent, 1989) that only certain string instruments accompanied voices. Contrary to that position the Céladon use instruments throughout: vielles, harp, lute, recorder, flute, percussion, Jew's harp and even clapping and stamping. I like their approach and for repertoire like this, which is mostly monodic, these extra colours are vital to keeping ones enjoyment at a high level. Intriguingly each song has a different ‘colour’ and approach - all cleverly devised without too much over-‘orchestration’. One song is even spoken for much of its course. In addition instrumental interludes are restricted, mostly to the longer songs; there are only a few. This CD is beautifully presented with a vivid, colour manuscript illustration of a Lescurel song on the booklet front. All the texts are offered, in the original, in modern French and in English. Anyone who buys this disc will not be disappointed. For me it is, to date, one of the outstanding releases of 2016.